You would think his dominant victory over Nate Diaz to notch his second straight title defense would be the hot topic of conversation, instead attention quickly turned to the thin piece of wood that shockingly popped out of Henderson’s mouth the second their scrap concluded. “I normally do [fight with one in my mouth], yeah,” Henderson initially admitted. “I have it in practices, when I spar and when I fight. It’s a bad habit, but whatever. ‘So far’ might be the key words. 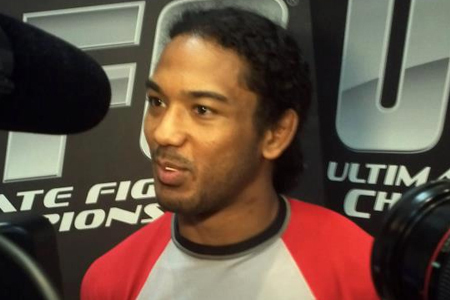 Now that he let the cat out of the bag, expect for athletic commissions to keep an eye out for Bendo’s comfort stick in future fights. Realizing that he may have shot himself in the foot, Henderson quickly tried to close the floodgates by retracting his original statement. When asked if Diaz could shed light on”Toothpickgate,” he would neither confirm nor deny the champ was sporting it during their 25-minute tango. “I don’t know if he did, but that’s weird,” Diaz expressed.